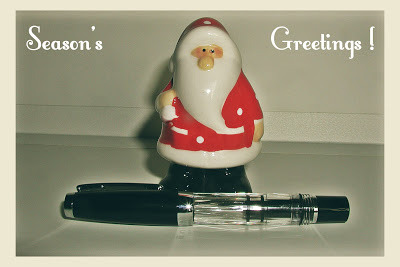 Vancouver Pen Club: Season's Greetings! ... and best wishes from the Vancouver Pen Club for a very Happy New Year, too! ~~~~~~~~~~~~~~~~~~~~~~~~~~~~~~~~~~~~~~~~~~~~~~~~~~~~~~~~~~~~~~~~~~~~~~ Our next meeting will be held on Thursday January 17, 2013 at Perks pen store (5844 Cambie Street, Vancouver, BC). The meeting will start at 6:30pm, and the theme will be "Demonstrator Fountain Pens" (e.g. the lovely new TWSBI Mini fountain pen I got from the Alexander Pen Co. in Ontario, shown in the photo with Santa above). As usual, our secondary theme will be New Acquisitions. Hope to see you there!